This weekend we went for a drive out to the eastern part of San Jose, Costa Rica to explore the Irazú Volcano (Volcan Irazú). There was too much cloud cover so we re-routed our trip to pass through a few little quaint towns just south of the volcano. 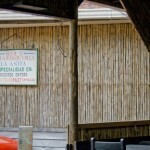 We drove through Cartago to Orosi and found a great little bamboo shack with promise of delicious fish. We were thinking it would be trout from the river, but when we were told that the fish was no good, we didn’t argue. We accepted the corvina (a delicious whitefish) substitute and enjoyed one of our favorite meals so far for around $1.75 each, which included fries. Of course we couldn’t forego the ceviche, and opted for the fish and shrimp variety. It had a special tang and we enjoyed every bite of it. The ceviche is always a good gauge of how the rest of the food will be at a restaurant. We have become right snobs for it. 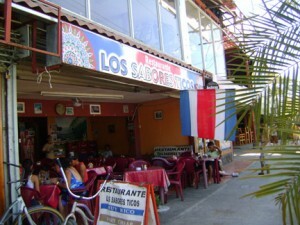 So, the more I look, the more I realize that there is cheap food here in Costa Rica, you just have to search for it. This place came with a mountain town feel and a beautiful lake just down the road. We know where we’ll be stopping the next time we pass through.